I am Ge YANG in Paris, a Chinese teacher and a mum of three kids. As a living overseas, a mum of three kids, I see the importance of creating a Chinese environment for children. As a Chinese teacher who teaches junior high school students, facing three children who have not yet attended school, I even have no idea how to teach them. But I always adhere to one principle: speak Chinese with your children and tell stories in Chinese for them. When the child can focus on seeing things and catching things in the hands, I show her a black and white color book. Then I explain the story and item in black and white in Chinese. The book is always placed next to the child. When she is awake, she often takes this book and play with it. Although it’s not her stuffed toy, she is accompanied by it and growing with it every day. I bought a lot of books and touchable books since my child can sit up when she is six months. I have tried to talking with my child, even she may not understand the content. But the advantage of parent-child reading is that it allows child to feel the companionship of the parents, build a trust relationship and enhance their sense of security. I think, for this reason, my three children are willing to listen to me for a long time even they can’t understand well what I’m speaking. Slowly, children will have a conditional reflex. It seems that when they sit on my lap, they will pick up a book. When I study, I will also observe whether they are paying attention to what I’m reading. The result of observation is that most of the time they pay more attention to the book and they image, and they also use their fingers to point to the patterns they are interested in from time to time. If they see the pattern on the book in real life, they will be particularly excited, shouting and pointing the item they saw in the book, or describing this thing in their own way. Similarly, when reading a book, they will be connected with the real thing. They soon find out that the item they saw in book existing in the real world. Once this concept of representation begins to strengthen, they carefully observe the pictures in the book and find out the connected relationship between the pictures and real things in life. They will feel that this fun comes from books, and I saw also the light in their eyes, the light coming from a fulfill curiosity, the light of a growing mind. This positive reinforcement stimulates them to try again and again, making them feel the joy of reading. If you spend a lot of time reading with your child every day, you will find that the number of times the child picks up the book is getting more and more, and the time for reading is getting longer and longer. What books did I choose for my children during this period? 1. Choose a book that is closely related with your child's daily life. For example, there are bottles, diapers, clothes, toys and fruits in the book, so that he can quickly connect the real thing with the book. 2. Select the book with a topic of “Finding Things”, such as: what is hidden in the elephant's ear, what is hidden behind the stone. 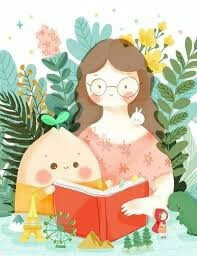 There is also a type of book that children can touch it to feel, such as the soft hair of a puppy, the smoothness of a fish's body, the graininess of an orange, the stickiness of a chocolate sauce, or the smell of a flower. When we put these books in front of children, then they will be more curious to explore every corner of the book. Keeping curiosity while reading books is also an important part of cultivating reading habits. In Chinese teaching and parent-child reading, I advocated letting children get in touch with the five senses, mobilizing all kinds of senses to understand the things in the book. Then parents interact with children while reading, leading them not only read the book but also establish contact with the things and generate recognition, build their sense of recognition and strengthen parent-child relationship. When I am reading, I will read the books that my children gave me. They prefer a certain book at a certain time. I also follow their request. Sometimes I read a lot of times and I will feel a little annoyed, then I ask them whether we can exchange our books. Most of time my asks have all been rejected. I think the book chosen by children has something he likes or something he doesn't understand and would like to explore. Moreover, when he didn't want to read or his concentration was not concentrated, we stopped, and I basically played the role of helper.In addition to sleeping time before going to bed at home, our family read together, according to children's needs, and there is no fixed time. The above is my reflection on the reading of 0-1 year old children.